There's a lot to consider when searching for a bar feeder solution that will deliver the best performance and ROI for your unique requirements. 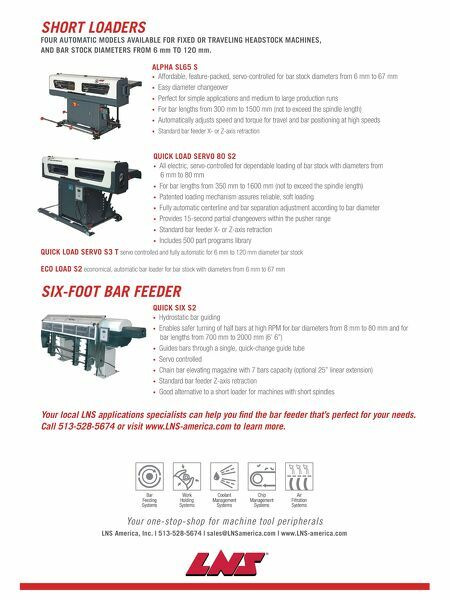 LNS has the most advanced and broadest line of bar feeders available in 12-foot, short loaders and 6-foot (half bar) models. Plus, only LNS backs up every bar feeder with global sales, technical service and unmatched customer support. 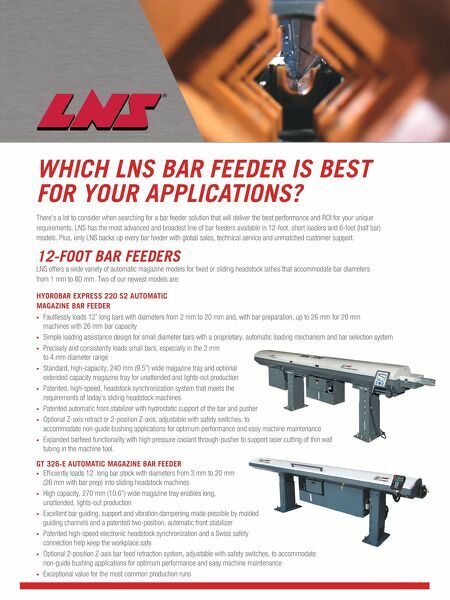 12-FOOT BAR FEEDERS LNS offers a wide variety of automatic magazine models for fixed or sliding headstock lathes that accommodate bar diameters from 1 mm to 80 mm. Two of our newest models are: HYDROBAR EXPRESS 220 S2 AUTOMATIC MAGAZINE BAR FEEDER • Faultlessly loads 12' long bars with diameters from 2 mm to 20 mm and, with bar preparation, up to 26 mm for 20 mm machines with 26 mm bar capacity • Simple loading assistance design for small diameter bars with a proprietary, automatic loading mechanism and bar selection system • Precisely and consistently loads small bars, especially in the 2 mm to 4 mm diameter range • Standard, high-capacity, 240 mm (9.5") wide magazine tray and optional extended capacity magazine tray for unattended and lights-out production • Patented, high-speed, headstock synchronization system that meets the requirements of today's sliding headstock machines • Patented automatic front stabilizer with hydrostatic support of the bar and pusher • Optional Z-axis retract or 2-position Z-axis, adjustable with safety switches, to accommodate non-guide bushing applications for optimum performance and easy machine maintenance • Expanded barfeed functionality with high pressure coolant through-pusher to support laser cutting of thin wall tubing in the machine tool. GT 326-E AUTOMATIC MAGAZINE BAR FEEDER • Efficiently loads 12' long bar stock with diameters from 3 mm to 20 mm (26 mm with bar prep) into sliding headstock machines • High capacity, 270 mm (10.6") wide magazine tray enables long, unattended, lights-out production • Excellent bar guiding, support and vibration dampening made possible by molded guiding channels and a patented two-position, automatic front stabilizer • Patented high-speed electronic headstock synchronization and a Swiss safety connection help keep the workplace safe • Optional 2-position Z-axis bar feed retraction system, adjustable with safety switches, to accommodate non-guide bushing applications for optimum performance and easy machine maintenance • Exceptional value for the most common production runs WHICH LNS BAR FEEDER IS BEST FOR YOUR APPLICATIONS?